We’re just at that moment in previews where everything is going great, but we’re fine-tuning and bringing in new lines and, you know, all that stuff.” Molly Ringwald is talking about her new play, Modern Orthodox, an Off Broadway comedy about a secular Jewish couple who take in an Orthodox diamond merchant. It’s filled with lines (“There is no word for thin in Yiddish!”) that bring down the house, if the house is filled with the Upper West Side. Her voice is a bit raspy; she’s recovering from laryngitis, which she caught from her OB/GYN. “I love my character,” she continues, “she’s smart, sassy, funny … and vulnerable.” The pause is telling—vulnerability was always her trademark. The last time many of us saw Ringwald was 1986. She was standing next to Duckie (Jon Cryer) at the prom, casting a longing, hurtful glance at Blane (Andrew McCarthy) across the room. It was the final scene of Pretty in Pink, and OMD’s “If You Leave” was playing in the background. At 18, Ringwald was at the peak of her fame, and, in a way, at the end of it. She turned down a role in a subsequent John Hughes movie, Some Kind of Wonderful, and, after a series of unsuccessful projects, decamped to Paris. In her new city, she went native, becoming fluent in French and marrying the novelist Valery Lameignere. But the expatriate dream ended in 2002, with Ringwald filing for divorce, and now she’s back in New York. A vintage celebrity hidden among us. 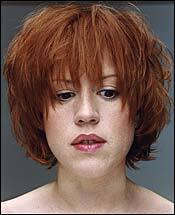 It’s difficult to explain, to those who weren’t teenagers in the eighties, just how large Molly Ringwald once loomed in our lives, and why, even now, she must be coy about where she picks up her coffee. For many of us, she was the first real teen we watched at the movies. Graced with what Pauline Kael described as a “charismatic normality,” Ringwald appeared in three films with the writer-director Hughes—Sixteen Candles, The Breakfast Club, and Pretty in Pink—that were period-correct fusions of high-school fashion, music, and slang. If you were white and suburban and insecure, you came to the theater and saw yourself. The stage was Ringwald’s first home, and her childhood sounds like something from the vaudeville era. Born in Sacramento, California, she was the youngest daughter of Bob Ringwald, a blind jazz pianist. Ringwald would belt out classic torch songs, accompanied by her father, and, at age 6, she even released an album called I Wanna Be Loved by You, Molly Sings. Her spin in the Broadway revival of Cabaret was the fulfillment of a long-nurtured ambition, and she hopes to work with Stephen Sondheim someday. And, like many American celebrities, she was on the boards in London recently, playing the part of Sally in a West End production of When Harry Met Sally. Overseas, her career was not up for inspection, but Stateside, some aspects of her Dweezil Zappa–dating days are returning. “Jason and I would go around the corner and get a sandwich,” she says, “and there would be, like, the paparazzi. That rarely happens to me because I’m rarely with anyone who is famous. My partner is not famous, and most of the people we know are not famous.” Ringwald lives with her boyfriend of three years, Panio Gianopoulos, a book editor and a writer. Younger than Ringwald, he published an elegiac essay about dating older women called “Confessions of a Boy Toy” in a recent anthology.